This summer term VIP Studio Sessions launches an exciting Grime competition for its users across the UK. 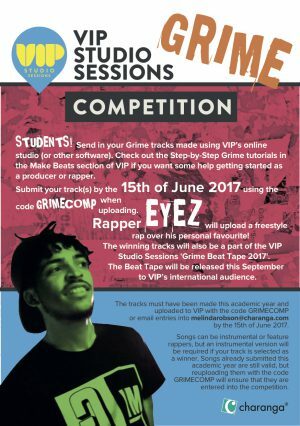 Winners of the Grime competition will be featured in the VIP Grime Beats Tape 2017, released this September with one lucky song chosen by popular rapper Eyez to rap on. What’s more, they will have a chance for their songs to be played in our collaborative Grime opera project with Essex Music – Grown: A Grime Opera. We are asking schools and teachers to encourage their students to enter as many of their Grime productions by the 15th of June 2017, which could feature rap vocals as well as instrumental tracks in the genre. Last year, VIP introduced its Step-by-Step Grime tutorials, where students are shown how to produce their own original music, whilst teaching them the rhythms and ‘rules’ of the genre. Grime is increasingly becoming one of our most popular genres within VIP, reflecting what is popular amongst young people in the UK. Within VIP’s online studio, students are able to upload their finished tracks for teachers and us to hear and mark, by using the code GRIMECOMP during the upload process. Tracks will then automatically get entered into the competition. For further details or to send in entries please email melindarobson@charanga.com by the 15th of June 2017. Trial VIP Studio Sessions free for 30 days.